If you’re a serial mobile phone offender, texting and talking on the phone while driving, then you’re in for a world of trouble. Coming into effect from July 1, 2018, the Road Transport Legislation Amendment Act 2018 No 15, is set to curb mobile phone usage by motorists. It is worth noting that NSW is the first jurisdiction in Australia to introduce this legislation. According to reports, there have been over 100 crashes due to mobile phone use while driving, from 2012 to 2017, resulting in seven deaths and over 100 injuries. If caught, drivers will be fined $330 and will incur 4 demerit points. And if caught in a school zone, the fine will be $439. Advocates of the legislation are calling for even stricter penalties for infringements, saying that the only way to ensure safety on roads is to ensure that offenders lose their licenses. Bluetooth is the way to go for attending calls whilst driving. 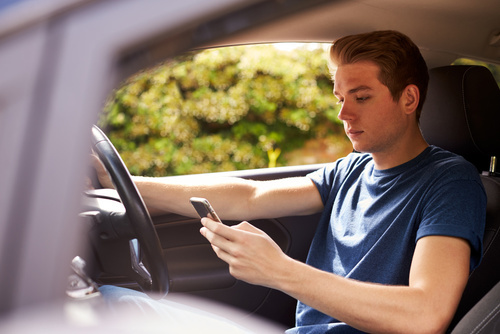 Texting at the traffic light while waiting for the light to turn green, pulling over to talk on the phone while your car’s engine is still running will not be tolerated. So, your best bet is to completely refrain from touching your phone while driving. Earlier this year, two police officers were injured, with one losing part of his leg, after being struck by a distracted driver who was using his mobile phone while driving. The incident occurred while highway patrol officers were conducting breath tests on Campbelltown Road, when a 22-year-old driver ploughed into the scene, causing grievous injury. The horrific incident was the last straw in a series of mobile phone related road accidents that prompted the NSW government to call for stricter laws to tackle the growing issue. The NSW Roads and Maritime Services’ Road Safety Plan 2021 is focused on making our NSW roads safer. Let us help them achieve their goal. A life lost, just because someone chose to pay more attention to the text they were sending than to the road, is not the kind of society we want our children to grow up in. So, it’s time for a change. And that time is now!